All we are please to annouce the start of a beginners course at our Chadwell Heath Dojo in March. If you are interest please contact us for further information. The Chadwell Heath Club is starting a Weapons class to be held on Monday evenings from early June. This class is for any beginners or practioners of other arts who are unable to practise Aikido due to any injuries or long term health issues but would like to practise traditonal Japanese weapons such as Ken, Jo, Tanto and Iai. The Aikido Circle is an independent organisation that has been training people in this traditional martial art since the 1970s with dojos in the UK and overseas. 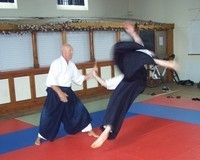 It is registered with the British Aikido Board which is recognised by Sport England as the only governing body for Aikido in the United Kingdom.